Ever since the start of the Marvel NOW! era of Deadpool, Marvel has made an effort to expand the character's presence beyond his '90s origin. The inventory flashback issues drawn by Scott Koblish established his existence in the 1970s so that they could eventually introduce his daughter Ellie. His "appearances" in the 1950s and 1960s are probably jokes, but they do involve Cable and provide a loose explanation of why his timeline is so complicated. The Deadpool vs. X-Force mini-series decided to take the questions about Wade's origins even further by reimagining the events just prior to his New Mutants debut. Duane Swierczynski had a lengthy run on Cable and he brings that past history with him, writing a fairly traditional version of Nathan Summers tasked with tracking Deadpool while he mucks up the timestream. This is one of the rare occasions where I like that they didn't go with Gerry Duggan, Cullen Bunn, or another frequent Deadpool writer. When he first premiered, Deadpool wasn't funny. He made a few wisecracks but he was a one-note killer who didn't even have his yellow dialogue balloons yet. Seeing the original white balloons with red outlines immediately conveys to the reader that this isn't the merc we're used to. Fitting with both Cable's general time travel theme and the ongoing retcons of Deadpool's adventures, there's a sense that the shenanigans of this miniseries are just one iteration of a loop of interactions. There's an interesting overall lack of personality with the X-Force characters. Warpath is always enraged, Boom-Boom is always overwhelmed, and Cannonball is just dull. But all of this is actually intentional, with Swierczynski evoking their one-note characterizations from the early days of X-Force. Domino is the only real spark of life among them (she may or may not actually be Copycat, but that wouldn't be revealed for a while in the context of X-Force). The overall main villain has his characterization complicated by the time-twisting going on but is fairly generic as well. Time travel plays an enormous role in Deadpool vs. X-Force. Deadpool has been hired to go back and meddle with history in order to make America a white nationalist superpower long before it would do so naturally. This first has him coordinating the Continental Army to slaughter the Redcoats during the American Revolution. Once X-Force encounters this, the team has to split in half, with Cable, Domino, and Warpath heading into the future to find Deadpool working with the Confederacy. It takes a while for this plotline to make sense, but it finally does once the advanced Union Army arrives with their steampunk battle suits. This second plotline feels like a reference to Harry Turtledove's Guns of the South, the classic counterfactual novel about white South Africans arming the Confederates for similar reasons. From this point on, the time travel starts affecting other Deadpool flashback stories when Wade is sent forward to protect Hitler from other time travelers. You might remember from my review of The Wedding of Deadpool that Cable, Deadpool, and Nick Fury teamed up to kill Hitler in the best Koblish inventory issue. I can't call this an inconsistency or even really complain about it since it's clear that this is all being done jokingly. It's just weird that there are so many Deadpool adventures that he ends up crossing his own timeline. Perhaps there's a story to be told one day of the modern Deadpool meeting his earlier incarnation during the events of this series. Artist Pepe Larraz is a rising fixture of Marvel's X-books, having previously worked on titles like Wolverine and the X-Men and X-Men '92. His work on Deadpool vs. X-Force most likely helped him get the latter assignment. His style is similar to the cartoony art of Salva Espin but with some of the realism of Mike Hawthorne. In other words, he was a great choice as a Deadpool artist, especially at the end when he has to blend the story back into Rob Liefeld's original New Mutants #98 pages. There are several points where Larraz arranges the page so that no one's feet are visible, and colorist Nolan Woodard nails the '90s color palette. 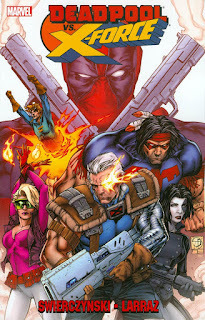 If you enjoyed the Deadpool movie, then Deadpool vs. X-Force is a good starting point for catching up on the comics. I was very impressed by the film and its accuracy towards many of the classic Deadpool eras, from St. Margaret's School for Wayward Girls to Bob, Agent of [Similar to But Legally Distinct] From Hydra. At the very least you'll get the context of the post-credits scene with this revised introduction to Cable.